John Henry Scott, 89, a longtime resident of Fredonia, left this world on September 1, 2018 to join his bride just in time to celebrate their 62nd wedding anniversary. John was born on January 9, 1929 in Liberal, Kansas to Benjamin and Lucille (Tepner) Scott. John, fondly called Don, was a 1947 graduate of Fredonia High where he lettered in football and track. John was a proud member of the Kansas National Guard. While attending Washburn University in 1951 in Topeka, Kansas, John’s unit was called to serve during the Korean War. After training in Ft. Lewis, Washington, John was stationed in Okinawa, Japan for a year. Upon returning from service in 1953, John went on to earn a degree in Petroleum Engineering from University of Tulsa and began his career with Chevron Oil on January 31, 1958. John worked for Chevron in multiple capacities and cities, residing a majority of his career in Lafayette, LA., until his retirement in 1990. On September 2, 1956, John married Vesta Kingsbury. As their story goes, John went to make a deposit at the local bank where Vesta worked. When he walked in the door, Vesta tilted her chair back to take a better look at him and her chair fell. They laughed many years as to how she “fell” for him, and John continued to share this story just a few short weeks before his death. Their union lasted 60 years when in 2017, Vesta was taken as a result of Alzheimer’s. John faithfully took care of Vesta in their home until the time of her death. During their time together, John and Vesta enjoyed raising their family of four children, being wonderful grandparents to their 5 grandchildren, serving their community, traveling overseas and spending time with longtime friends. John and Vesta returned to Fredonia in 1993 where he became a member of Fredonia Golf Club as golfing was a passion of his. In addition to golfing, John and Vesta reconnected with childhood friends and family and spent many fun filled years with John’s “Dirty Dozen” gang and their spouses. John believed in a community of service to others. He was a Boy Scout Leader for 15 years with his first Troop in 1961 consisting of students from the Mississippi School for the Blind sponsored by the Lions Club. His sons built lifelong memories of camping trips and hiking “Parrot Beak” in Natahala Mountains of the Appalachian Mountains. In addition to his Boy Scout years of service, John and Vesta remained very active in their church families serving in many capacities such as Deacon, Elder, Treasure and on various church boards. John served Meals on Wheels for 15 years and worked with Road to Recovery through the American Cancer Society where he drove cancer patients to their appointments. John is survived by his children, Stacy (Paula) Scott of Opelousas, LA, Sandra (Guy) Lowe of Sugar Land, TX, Kevin Scott of Fredonia, and Kathryn (Bill) Cassidy of Corpus Christi, TX, grandchildren, Caitlyn (Geoff) Elkins of New Orleans, LA, Scott Lowe of Dallas, TX, Chad Lowe of Sugar Land, TX, Ryan Cassidy of Corpus Christi, TX, and Jarod (Emily) Cassidy of Corpus Christi, TX. He also leaves behind his three wonderful great grandsons Finley Andrew and Miles Henry Elkins of New Orleans, LA and Oliver James Cassidy of Corpus Christi, TX. He is survived by his beloved sisters, Lillie Kissinger of Derby, KS, Lora Ramsey of Medford, OK, and Karen Shinn of Topeka, KS. His brothers Dewey of Mahomet, Illinois, and Gary (Pat) of West Burlington, IA, along numerous nieces and nephews whom he loved very much. John is preceded in death by his beloved wife, his parents, and brother, Bennie. The family would like to express sincere gratitude to Harry Hynes Hospice who cared for Dad in his last moments allowing him to leave this world peacefully and to Sheri Shelton who selflessly gave her time to sit with Kevin and Dad while the remainder of the family was enroute from various locations to Fredonia. We do not meet people accidentally. They are placed in our lives by God. God placed Sheri in our lives to be a part of our parents’ journey and ultimately be with Dad at the end of his journey. For this, we are eternally grateful. Dad and Mom considered her a daughter, and to us, she is a sister. 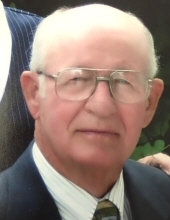 In lieu of flowers, memorial contributions may be made to Harry Hynes Memorial Hospice or Fredonia First Christian Church collected by Wickham Family Funeral Home at 510 N. 7th Street, Fredonia, KS. 66736. Services will be held at 11:00 A.M., Saturday, September 8, 2018 at Wickham Family Funeral Home with viewing at 10:00 A.M. and burial to follow at Weakly Cemetery, West of Fredonia. To send flowers or a remembrance gift to the family of John Henry Scott, please visit our Tribute Store. "Email Address" would like to share the life celebration of John Henry Scott. Click on the "link" to go to share a favorite memory or leave a condolence message for the family.